"Do you think he has to go...?" Many dog owners have said these famous last words moments before Fido relieves himself on the living room carpet. As busy New Yorkers, it's hard to find the time to train your pup. Before giving up on your new dog and oriental rug, take a moment to read my housebreaking tips! First, a little mantra to recite as you clean up the messes: Patience, Praise, and Routine. Positive reinforcement is also important. 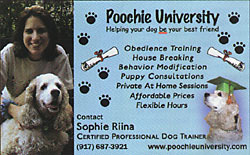 Click here to visit Poochie University. Crate training is a wonderful way to housetrain your dog. Dogs don't like to eliminate where they sleep or eat. People look at a crate and say, "Oh how cruel...a cage!" It's only a cage if you use it like one. But if you treat the crate like a den, it becomes a teaching tool. A rule of thumb for choosing a crate is that your pup or dog should be able to turn around and lie down and not have to slouch while sitting in the crate. For a large breed puppy, get a large crate with a divider-your crate will grow with your pup! Leaving a pup with access to food all day is a housebreaking recipe for disaster. Keep Fido's food available to him for no more than 10 minutes. If Fido begins eating at 9 minutes and 30 seconds, he has 30 seconds to eat and that's it. It sounds cruel, but he'll finish the next meal in the allotted time. This is the beginning of a proper routine. When your pup goes to the bathroom outside, hold your applause until he has finished. By praising him before he is finished, you may distract him from the task at hand. When he is finished, reward Fido with treats and praise. You and your puppy are a team: more often than not, if your puppy eliminates in the house, you missed the signals: pacing, sniffing the floor, whining and standing by the door are big neon signs indicating your puppy's need to go outside. If you catch Fido red handed, correct him with a big loud growly "AH-AH-AH." Then, immediately take Fido outside. If he continues to eliminate, praise lavishly! Many dog owners believe the dog park is a place of 'business', whereas little Fido sees it as a place of play. With so many fun things to do (such as wrestling with other pups), number one often becomes #10 on the to-do list. Dog parks are invaluable tools for the owner when it comes to exercise and socialization; however, for Fido to perform his duty (no pun intended! ), the activities of a dog park can be a big distraction. When you take Fido outside, find a quiet, distraction-free place so he can relieve himself. If all business has been conducted, then you may proceed to the dog run as a reward. Jorge Melara is a professional dog trainer and columnist for Westchester Life magazine. He can be reached at (718) 432-2927.